Blighted ovum HCG levels with doubling time and rising levels of the pregnancy hormone. A woman done her first pregnancy test and show a faint line which means weak positive pregnancy. After a week, cramps and slight bleeding. In the emergency ward at the local hospital, the Gynecologist done an internal ulstrasound and can’t see any sac. She told the doctor that she’s in the week 6 and 3 days. At the clinic one day later, the Gunecologist repeated the ultrasound scanning with transvaginal probe and found a little white speck in the sac. Tomorrow at laboratory: take a quantitative beta subunit HCG blood test and the results show rising HCG levels at 5 weeks and 5 days post LMP. The woman told me that she was worried and confused about the conflicts of BHCG levels and ultrasound. The first doctor recommended methotrexate upon diagnosis as ectopic pregnancy but the second doubling HCG blood test with white dot sac suggests a blighted ovum which require a dilation and curettage procedure. What’s the opinion of medical science? A blighted ovum is an early pregnancy failure after the fertilized ovum attached to the uterine but failed to develop an embryo even after 14 week LMP. That’s why I have blighted ovum pregnancy? When blighted ovum is occurred during the pregnancy? A blighted ovum occurs during the early pregnancy term (the first trimester), may be the woman didn’t know that she’s pregnant yet. Do HCG levels double with blighted ovum? Blighted ovum HCG levels still rise and high but not doubling enough as in normal pregnancy, blighted ovum symptoms is the same with normal pregnancy. lack of symptoms of blighted ovum is common. HCG level 680, after 48 hour HCG level 1800, no sac on ultrasound, no bleeding and no cramps. Answer: The case is for a normal pregnancy till now and the time scale can’t tell the right expectation, the advice is to wait until the week 8 at least. Ultrasound noticed one inch empty sac, still feel pregnant even blood pregnancy test is negative and urine pregnancy test is negative too. Felt a baby in my belly, discharges from my breast when squeezed. Can be a blighted ovum even after 12 weeks? The Answer: A small sac with nothing in it and HCG level below 5 units after 5 weeks must refer to a blighted ovum. You had missed miscarriage. Get the Ob/Gyn advice for natural miscarriage or by D&C operation. What to do for blighted ovum management? If your body still acting as you’re pregnant, doctors would recommend to wait few days until the body passes this anembryonic (no embryo) pregnancy naturally. And can conceive as close as the next week, as the period is due within a month and HCG levels can back after nearly two weeks. If you’ve blighted ovum conception your doctor will have two options, the pills or surgery. You shouldn’t be scary of D & C, it’s for your safety. The sac would expel by it’s own but remnants in the uterine may cause infection, so that the D & C would be beneficial to avoid complications. But woman must wait three consecutive cycles before trying to conceive again, the reason is to allow the uterine lining to rebuilt itself in the way to sustain another pregnancy. What to do with blighted ovum hcg levels and ultrasound? Blighted ovum is difficult to see on ultrasound until the week 10 LMP. Blighted ovum HCG levels 5 weeks LMP is within expected levels for normal pregnancy. Even with no embryo inside the sac the placenta and corpus luteum continue to produce pregnancy hormone at early pregnancy. At week 4 and 5 a yolk sac and fetal pole but no heartbeat, heart beat is the baby’s life determining factor inside you. You would find heart beat after week 11, and only babies with heart beat deemed live. What to do for blighted ovum with HCG levels rising? Most woman scarred after week 9 with no bleeding or pregnancy, so please understand first. If you have or expect a blighted ovum just relax and retest BHCG blood test and ultrasound until the week 12. 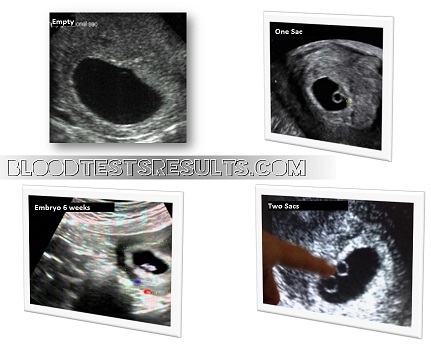 Confirm blighted ovum after week 14 with low HCG levels, no visible embryo sac, and no heart beat. Never rely on the sac size small or big or how sac is measuring when it’s empty. When do hcg levels drop with blighted ovum? From 4 to 7 weeks and up to 12 weeks for some women after a successful m/c or d/c operation, beta subunit HCG test after d/c can predict the dropping rate of HCG levels after blighted ovum miscarriage. We’re welcome to explain your pregnancy blood test results.